A Peruvian príncipe sets out to foil his mamá and marry the girl of his dreams in this Latinx-inspired adaptation of “The Princess and the Pea” from Spanish-language–adaptation veteran Elya (La Madre Goose, 2016, etc.). 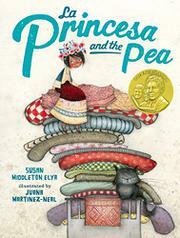 En route to her own castle, the titular princesa catches the eye of the prince, who invites her to stay the night. The classic Hans Christian Andersen tale unfolds with Latin flair in rhyming couplets sprinkled with Spanish vocabulary terms. The appeal here is for non-native speakers seeking an introduction to the language. At times the dual-language rhyme becomes awkward with phrasing that misses the mark in both languages, “The girl stretched her brazos / and yawned with her boca”—as if she’d yawn with anything other than her mouth? The text also fails to establish the mother’s motive for putting the pea under the mattresses, and for this reason background knowledge of the original is a prerequisite to truly enjoy this adaption. Martinez-Neal’s darling, soft-edged mixed-media illustrations bring the brown-skinned characters to life in costumes from different regions of Peru, while guinea pigs and alpaca fleece create an atmosphere of a busy rural textile industry.